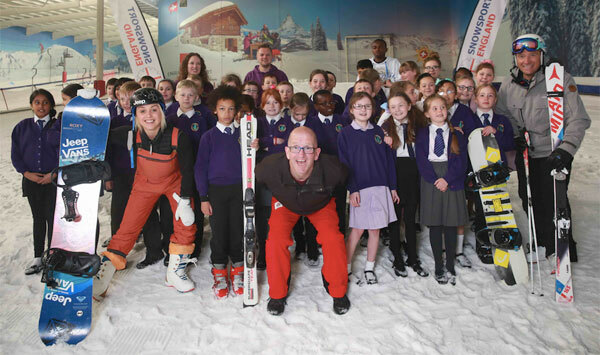 Skiplex in Reading is kick-starting the winter season with an Olympic themed roadshow featuring two of Great Britain’s most well-known skiers – three-time Olympian Chemmy Alcott and BBC Ski Sunday presenter Graham Bell. Slide2Sochi Sunday is being run in conjunction with governing body Snowsport England on Sunday 6th October and will give visitors the chance to get coaching tips from both Chemmy and Graham as well as ski or snowboard for free or for a hugely discounted price on the Skiplex endless slopes. With the Sochi 2014 Winter Olympics in February less than six months away the roadshow will be buzzing with Olympic fever with visitors able to sign a giant good luck snowball for the British wintersports athletes, have their face painted with their favourite country’s flag and find out how they can get involved in skiing and snowboarding and become the next wintersports hero as part of the GO SKI GO BOARD campaign*. There will also be a big barbeque on offer for all visitors, making it a great day out for all the family. Media are invited to the event and both Chemmy and Graham will be available for interview. Please email or call Betony or Vanessa if you would like to attend. Skiplex is a new way to learn how to ski or snowboard, get your ski legs back or fine tune technique. The revolving slopes are made of a forgiving carpet-like material which is much softer than the traditional dry slopes and the speed and gradient can be altered to suit all abilities. *The Slide2Sochi complements Snowsport England’s new national participation campaign GO SKI GO BOARD, www.goskigoboard.org.uk, which is aimed at getting more people into and back into snowsports. Snowsport England is the national governing body for snowsport in England www.snowsportengland.co.uk or www.facebook.com/SnowsportEngland.